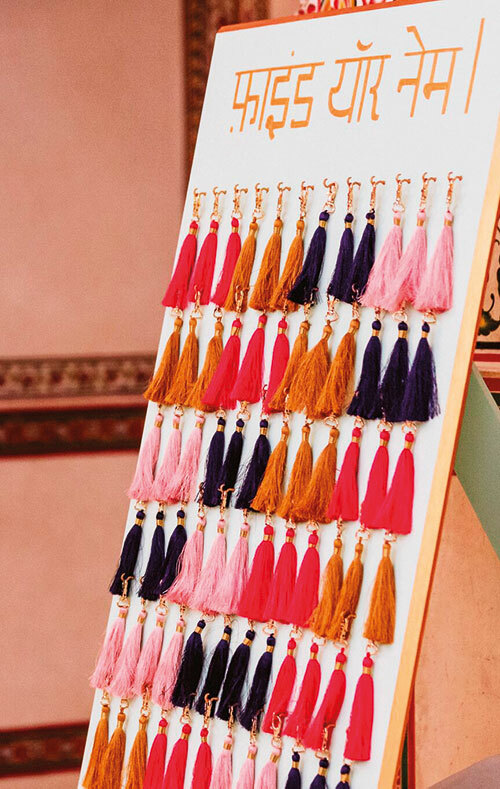 It’s common knowledge that Indian weddings are all about flashiness, noise and extravagant displays. 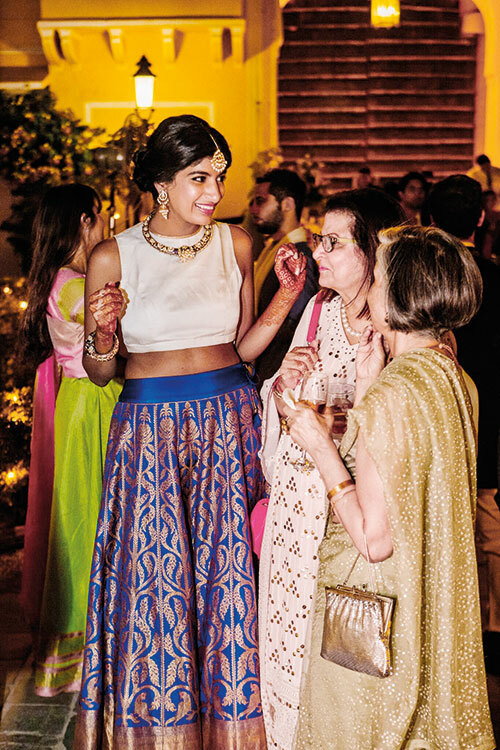 Heavy attire that bogs one down, jewels that cover almost every ounce of one’s skin, sky-high heels that barely allow one to walk, ostentatious decor that can be seen from miles away and blaring music that keeps the neighbourhood awake. It’s true when people succinctly sum up Indian shaadis by saying that it’s less about the couple, and more about the families. 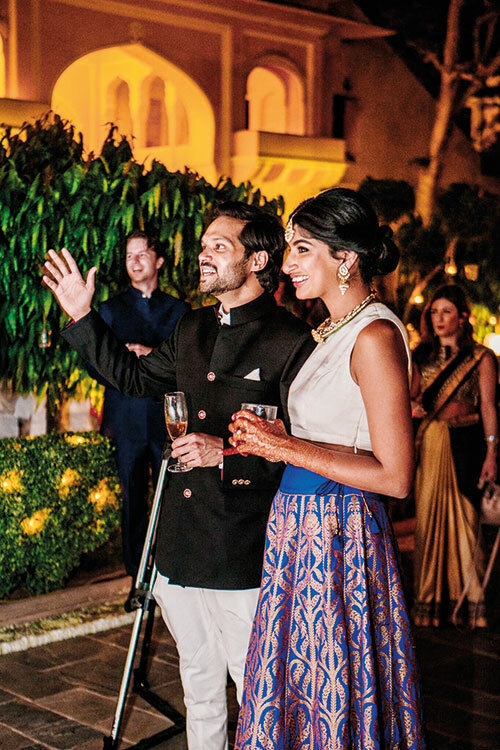 Designer Naina Shah, 33, and her husband, hotelier Abhishek Honawar, also 33, however, took the road less travelled when they opted for a relatively smaller, close-knit and quiet affair in Jaipur, in April last year. 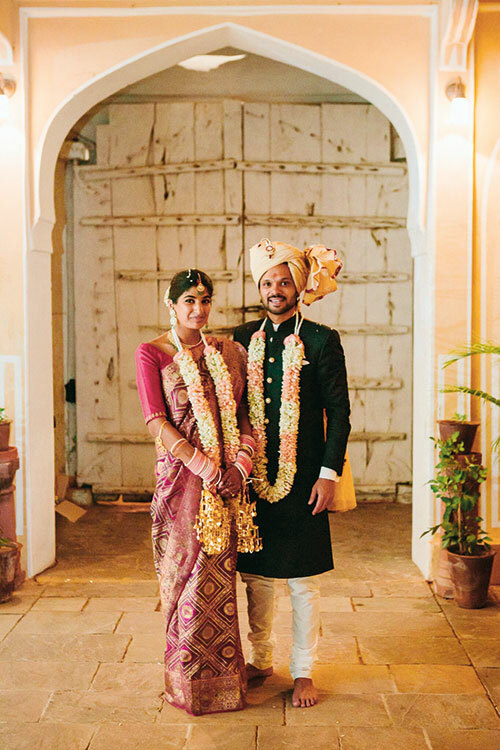 Shah, who runs a couture embroidery business with her mother in both Mumbai and New York, met Honawar, director at Neighbourhood Hospitality, in Mumbai through friends — they dated for five years before getting engaged. 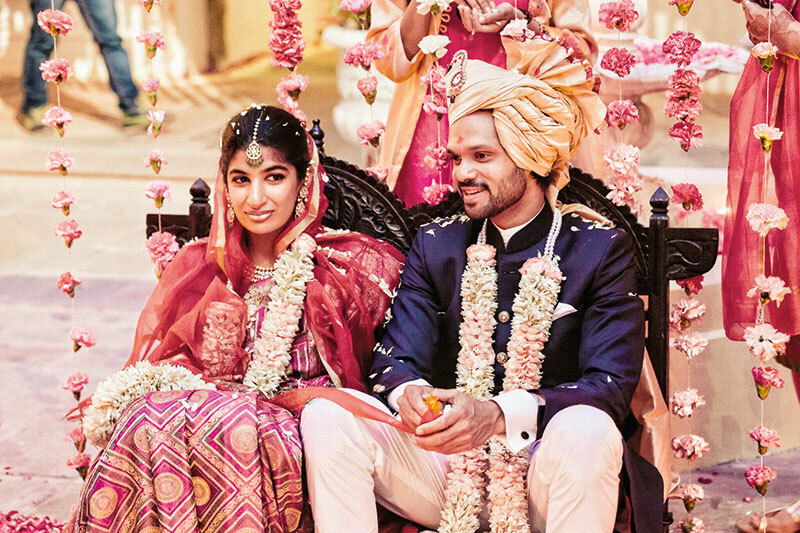 The happy couple is based primarily in New York for the greater part of the year, visiting India for about three or four months. 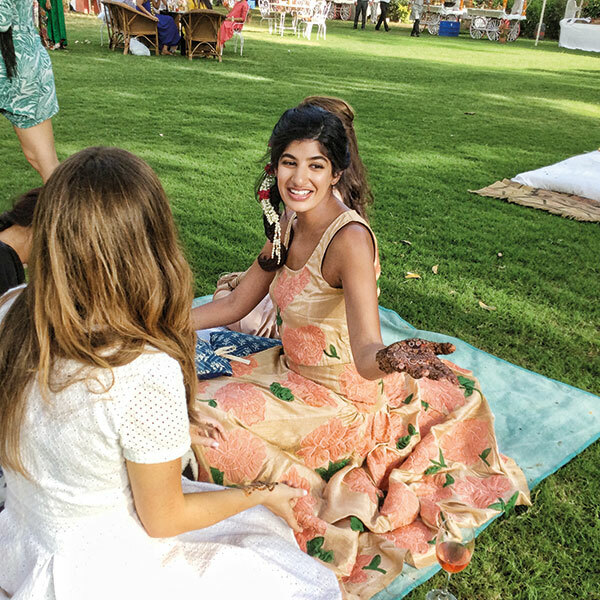 I catch up with Shah, who takes me through the special event and gives me a peek into her wedding trousseau. 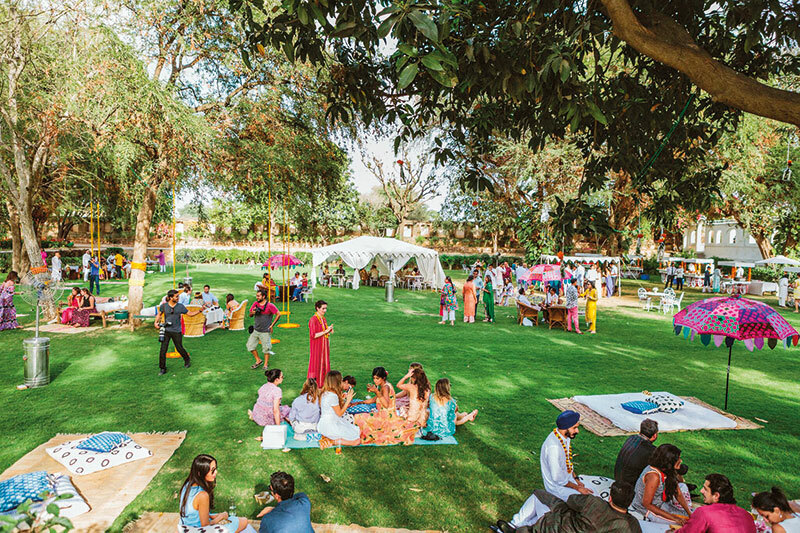 We had a lot of friends coming in from all over, so we spent the week leading up to the wedding in Jaipur and planned different things every night, which grew in scale as more and more people arrived. The first night, we had a small, intimate dinner with a handful of my closest friends from New York at 28 Kothi, the boutique hotel that Abhishek runs in the city. The next night, we had dinner and drinks at Hot Pink, which is one of our favourite places there — it’s a concept store owned by our friend Siddharth. As more people arrived from Mumbai and New York, we had a party at Siddharth’s farmhouse, which is probably my favourite place in all of Jaipur. It’s incredibly beautiful and peaceful, so it was amazing to be able to share it with all our friends. The next day, which was a Friday, was the official beginning of the wedding celebrations. 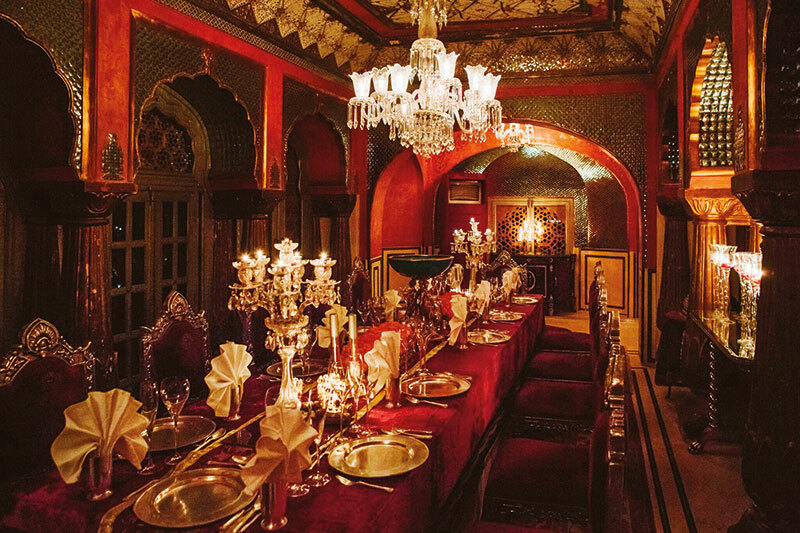 A welcome dinner at the Amer Fort was truly magical. The next morning, everyone left for Samode, which is about an hour outside Jaipur. 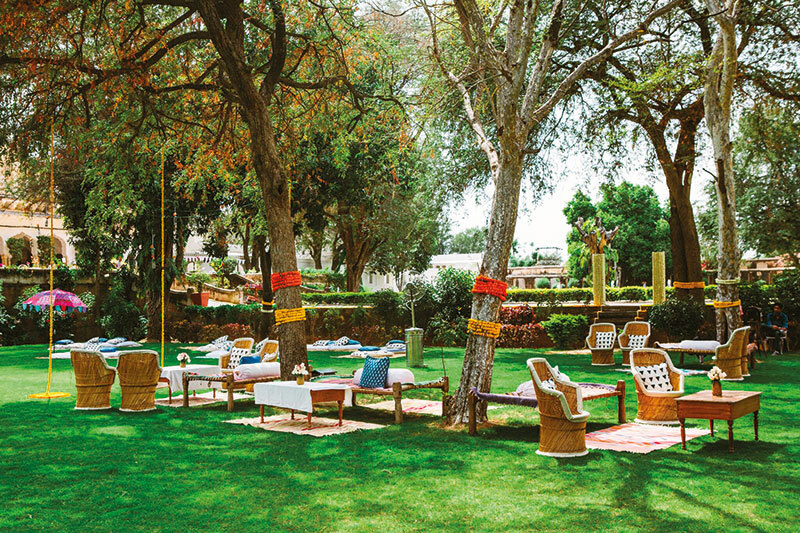 The mehndi that afternoon took place at the lawns of Samode Bagh. It was very casual — we just set up lots of dhurries and pillows on the floor for people to lounge around on while getting their mehndi done. We also set up croquet, badminton and a few other games. It was a hot summer afternoon, so I wanted it to be comfortable rather than have people in heavy outfits with loud music booming in the background. There were also these little bars and food carts scattered across the area. That evening, at the Samode Palace courtyard, we had an evening of cocktails, dinner and dancing. It wasn’t a traditional sangeet, but we did have a few friends and family perform for us, which was fun. The next day, the wedding ceremony was held at sunset. The hotel had suggested several locations for the actual ceremony. For instance, one option was over by the pool…but that just seemed a bit strange to us. We wanted it to be intimate, so we decided to have the ceremony in a small courtyard near the entrance of the hotel. 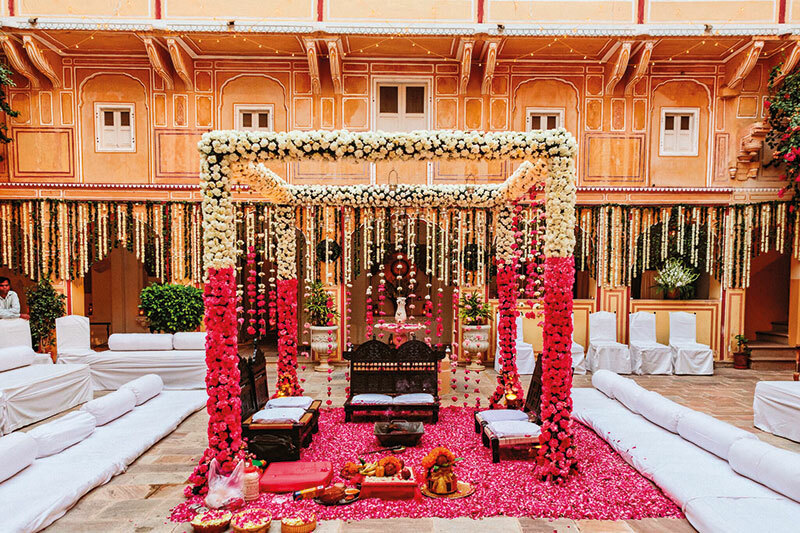 We had the mandap built with pink and white flowers and had candles and more flowers hanging from the top. It was very simple, but very pretty. After the ceremony, we had cocktails at the magnificent Durbar Hall, followed by a sit-down dinner outside, on the terrace. It was really nice having everyone sitting together. There were a few speeches, after which the band began playing…and everyone went back to dancing. 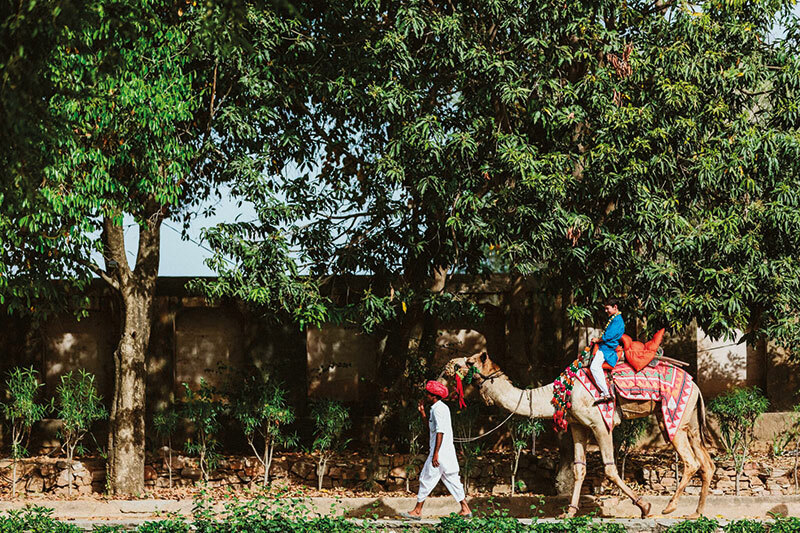 The first trip we took together was to Jaipur, and it remains one of the best that we have ever taken. We had both visited separately when we were younger, but going as a couple was a different experience entirely, and we had the absolute best time. It has become a place that we frequent together regularly and it remains very special to us. One of our best friends lives and is from there, which is a big reason for us visiting so often and loving it so much. When it was time to pick a location for our wedding, it was a no-brainer. 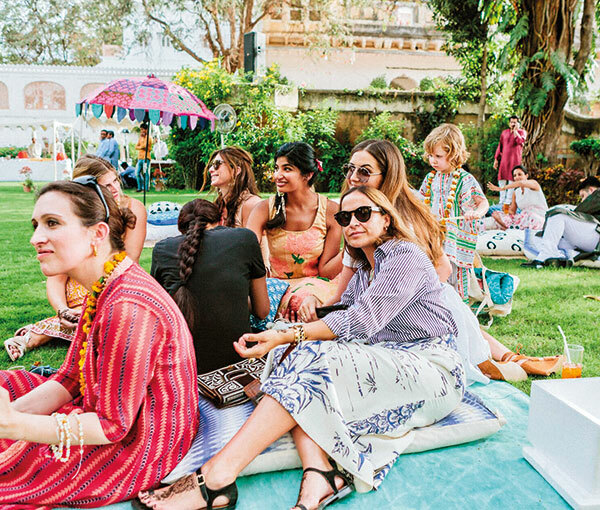 We always knew that Jaipur was the place to do it. I would say that my wedding style was pretty understated compared to a lot of Indian brides I’ve seen. I wanted to incorporate embroidery into some of my outfits since that is what I do for a living. 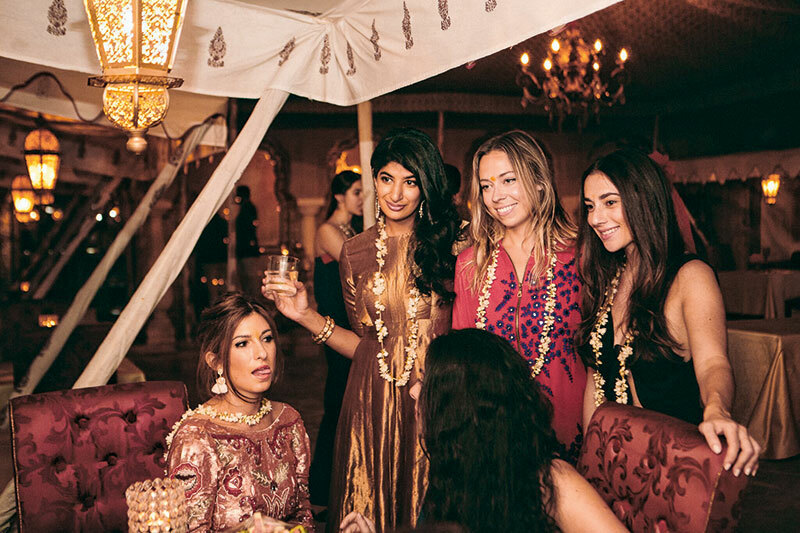 For the mehndi and reception, I made my outfits in my atelier in Mumbai, which was a fun project leading up to the wedding. For the sangeet night, I wore a lehnga by Sanjay Garg, who I love! I wore another gold ensemble by him for the welcome dinner as well. For the actual ceremony, I donned a vintage sari that belongs to my mother. 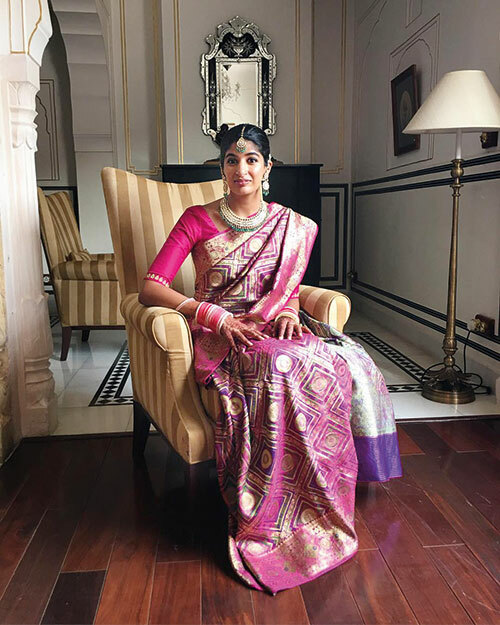 My jewellery was entirely from Jaipur’s Gem Palace — the best jewellery boutique in the world, in my opinion! I would say I have a pretty laid-back style. 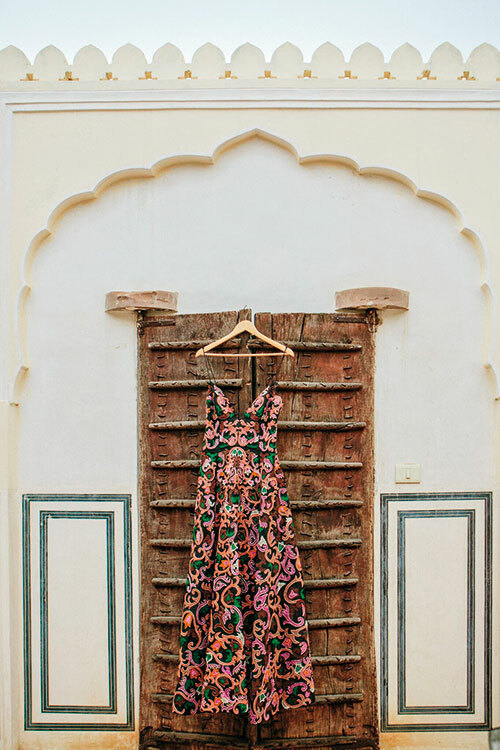 I love Stella McCartney and Céline, and in India, I have always been a big fan of Bungalow 8. When it comes to make-up, I try to stick to only natural skincare products and don’t really wear any during the day. I like to be comfortable! I think we just did what felt most natural to both of us. We did most of the planning ourselves, without much interference from our families. And so, we chose the events that we wanted to have and celebrated with the people who are closest to us. The crowd was a combination of family members, family friends and friends from both India and abroad. The best part for me was having all the people closest to me in the same space for those few days… friends and family from all stages of life. I think I was able to catch up and spend time with everyone, which was amazing. Had we opted for a bigger wedding, that would have been impossible.